In early March an abandoned flatbed truck was discovered on a freeway southwest of Chongqing. The truck’s bed was stacked with dozens of small crates, each containing four to six dogs. The dogs - totalling over 900 - were in the midst of a 22-hour journey to Guangdong province where they were to be slaughtered for human consumption. They were caged in living quarters so small that they could barely move - many of the dogs were sick, covered in urine, starved and dehydrated. Several of the dogs died along the way and one even gave birth in these horrid conditions. The vehicle was reported to local authorities by a local “good Samaritan” who thought the truck looked suspicious. The driver was detained and the suffering animals were handed over to the Chongqing Small Animal Protection Association where authorities tried to nurse the dogs back to health or in extreme cases, euthanized the ones which were aggressive or diseased. Many of these animals were still wearing tags or were pure bred indicating that they were stolen house pets; the future of the animals remains in limbo. If any good news can be gleamed from the horrors of the Chongqing story, it’s that a growing number of rescues have occurred on the mainland in the past few years. 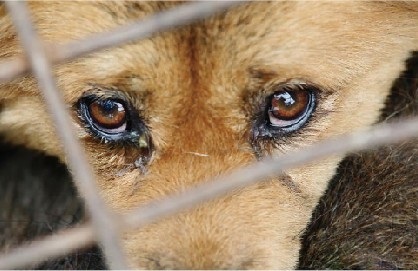 Humane Society International has reported six such incidents since 2011, which have saved the lives of over 2000 dogs. Similar instances have been reported which have resulted in the rescue of thousands of cats, that had endured the same type of cruel treatment. This type of mass transport is standard practice for the dog traders in China. The transport conditions are inhumane enough, but the fate which awaits the dogs once they reach their destination is much worse. The dogs are often killed in public – they are beaten to death with sticks, choked or slowly bled out from their neck. They are slowly killed in front of other dogs to induce fear and increase stress levels. Which is believed to release blood and adrenaline into the meat thereby improving the flavour and enhancing a man’s virility when eaten. But not everyone is against these practices, advocates argue that dog meat has been consumed in China for nearly 2500 years and is a part of the Chinese culture. Others are quick to cite the apparent hypocrisy involved in speaking out against the consumption of dog and cat meat, there is no law in China clarifying the distinction between livestock and companion animals. These are valid arguments of course but ought to be considered in broader context. One could make the argument that eating dog meat is as morally unobjectionable as eating pork, but the ghastly conditions in which the dogs are transported and slaughtered is unjustifiable. Further investigation into the animal rights issue in China reveals that household pets aren’t the only ones in danger; the South China tiger, the Chinese river dolphin, and many shark species are being hunted for various commercial purposes and are being pushed towards extinction. Likewise, the savage practice of extracting bile from the gull bladders of living black bears is an issue which is being hotly contested by the international community in spite of dismissal by supporters, it’s been a standard ingredient in prepared Chinese medicine for centuries. Fortunately, it appears that attitudes are shifting and social media is playing a crucial role, especially among young people. In fact, according to EnglishNews.cn, a dog eating festival in Hangzhou was cancelled in 2011 because, “…ninety one percent of over 12,000 users said "No" to the carnival in a vote on Weibo.com, a popular micro blogging site in China.” This gives hope for those trying to create momentum for a new era of animal rights awareness in China. That said however, animal rights laws have traces in the western world dating back nearly 400 years and seemingly the attitudes of a majority of Chinese citizens reflect modern international opinions on the issue. This has prompted a slight shift by the Chinese government. 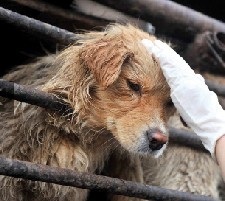 Their efforts to conceal the dog meat trade during the 2008 Olympic Games in Beijing shows increased awareness of the negative feelings across the globe towards the consumption of companion animals. Further evidence of this is the early reform efforts to improve zoos across China, this includes improved living quarters and discontinuing practices such as animal performances and live-feeding. There is doubt amongst experts however that any sweeping animal rights legislation will be passed or enforced. It is widely believed that reforms to regulate the fur farms and bear farming trade would destabilise the economy – these are huge sources of revenue for the federal government. Furthermore, a generally pro-business environment on the mainland means the government may be reluctant to get involved. And in spite of a surging outcry against the consumption of dog and cat meat, there is fear of potential backlash from traditionalists – not to mention those who feel a complete outlaw could disrupt the food supply of the world’s most populous nation. As China becomes increasingly integrated both economically and socially with the west, the feeling is that there should be some effort made to come to the centre on a variety of issues although they may be in conflict with their own beliefs and traditions. In the meantime, while politicians and diplomats wrangle over conflicting opinions, the fate of millions of animals hangs in the balance.